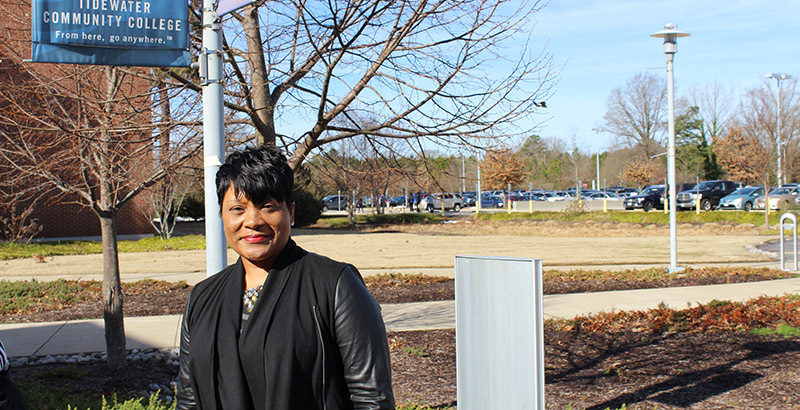 Those are words Tidewater Community College’s Katina Barnes attributes to Dr. Martin Luther King Jr.
Fittingly, those are words that also apply to Ms. Barnes, the inaugural director of the Portsmouth Campus Student Center, which opened in 2013. She assumed the new role of coordinator of dual enrollment academies on the Portsmouth Campus on Jan. 1. While her new office is in Building A, Barnes’ heart still holds a place for a student center that has become a vibrant building on campus and in the community. All programming on the campus aligns with general education competencies. Last spring, Ms. Barnes started “Champions for Change,” a retention effort geared toward males. Accompany Ms. Barnes on a walk through the Portsmouth Campus and she warmly greets nearly everyone who comes across her path. “Treat people as you’d like to be treated” is her mantra. In addition to her work at TCC, Ms. Barnes, 43, started her own nonprofit, Butterfly Village, which advocates for empowerment of women. She envisions ultimately establishing a literal village that would include a transitional home for young women, leadership classes, even a bakery. “I really have a passion for this and am working to make it happen,” she said. For the last 10 years, Ms. Barnes has been lead advisor for the Chosen Vessels Rites of Passage Ministry, an 18-month program at her church, St. Mark Missionary Baptist. The program meets on Saturday mornings and mentors high school girls transitioning to the next stage in their lives. Ms. Barnes also serves as executive director of Bases for Barnes Foundation, a nonprofit established by her son, Jimmy III, an outfielder in the Los Angeles Angels organization. Their efforts focus on fostering young African Americans in baseball and other charitable endeavors, including a recent holiday toy drive for autistic children. Ms. Barnes graduated with a Master of Arts in Urban Education – Community Counseling and a Bachelor of Social Work, both from Norfolk State University. She earned an Associate in Fashion Marketing Design from the Art Institute of Atlanta. Prior to coming to TCC, she spent 10 years as director of The Up Center, the region’s largest nonprofit family services organization. Ms. Barnes and husband Jimmy reside in the Deep Creek section of Chesapeake.